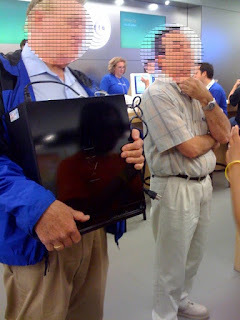 The Lurker was just visiting my local temple known as the Apple Store. I needed someone to coax an aged laptop back to existence. I was thwarted on that attempt. However I did have a bit of pleasure. I happen to be standing behind this guy while he was asking an Apple minion to help him. He explained his iPhone did not work and so he brought his computer in to explain the issue. As you can see his computer is made by Dell. The rep just kept saying why didn't you just bring your phone in? He seemed to be a wee bit confused by this new world. The Lurker fuzzed him out to protect his awesomeness.